J. Cataldo R.1, M. E. Hidalgo L.1, A. Neaman2, H. Gaete O3,4*. 1Depto. Química y Bioquímica, Facultad de Ciencias, Universidad de Valparaíso, Av. Gran Bretaña 1111, Playa ancha, Valparaíso, Chile. 2Facultad de Agronomía, Pontificia Universidad Católica de Valparaíso, Centro Regional de Estudios en Alimentos Saludables (CREAS), Región de Valparaíso, Chile. 3Depto. Biología y Ciencias Ambientales, Facultad de Ciencias,Valparaiso Chile. The agricultural soils in the basin of the Aconcagua River exhibit high concentrations of copper compared with other areas with no mining activity. The objective of this work was to assess the toxicity of such areas on the earthworm Eisenia foetida and its relation to copper concentration using the following molecular biomarkers: glutathione-S-transferase (GST), lipid peroxidation (TBARS) and metallothionein concentrations. These soils were also characterised chemically and physically. The results showed significant differences in the concentration of metallothioneins, TBARS and GST activity. A correlation between pH and copper (total, soluble) with the molecular parameters was observed. Metallothionein and GST are proposed as early warning biomarkers of the toxic effects of chemicals in soils. Keywords: Copper, oxidative stress, metallothionein, molecular biomarkers. Copper mining in Chile is one of the most important economic activities in the country but is also one of the most contaminating activities, for both aquatic and terrestrial ecosystems. Agricultural soils near these mining activities have increased levels of copper (De Gregori et al., 2003, Gonzalez et al., 2008), which represents a risk to soil organisms. Among these soil organisms, earthworms are important for their ability to decompose organic matter, recycle nutrients, and build soil. This important function can be affected by the presence of toxic chemicals in soil (Avila et al. , 2007). Although metals are essential nutrients for organisms, they are toxic at high concentrations (Ferreira-Cravo et al., 2009; Ginocchio and Narvaez, 2002, Navarro-Aviñó et al., 2007). The total concentration of a trace element in the soil is not sufficient to predict the potential ecological risk that it represents (Sauvé et al., 1998). Ecological risk is related to the bioavailability of the element, which at the same time is related to the chemical form in which it is found in the soil. The National Research Council (NRC, 2003) defines bioavailability as the fraction of the total element that is available to the receptor organism. Because of their ecological importance, earthworms have been used as indicators for assessing the potential impact of chemicals on soil organisms (Arnold and Hodson, 2007). Biomarkers have been measured in earthworms while assessing their exposure to contaminants in the soil through the measurement of antioxidant enzyme activity (Mosleh et al., 2007). The earthworm E. foetida is considered to be representative of soil fauna and earthworms in general (OECD 2000). 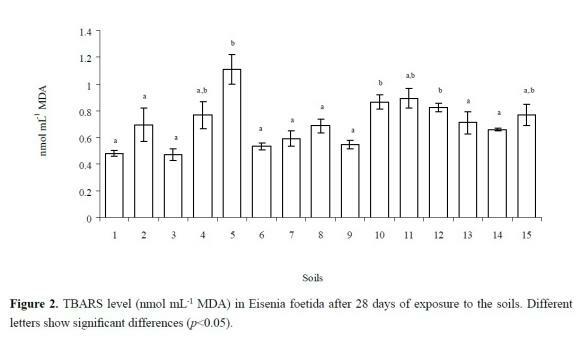 E. foetida is characterised by its increased sensitivity to chemical agents compared with other species of earthworms (Torricella, 2006). Biomarkers are biochemical, physiological, and histological reactions in organisms that can be used to determine exposure to and/or toxic effects caused by chemicals (Lam and Gray, 2003). The use of sublethal stress indicators as biomarkers is an alternative approach that is potentially useful to assess the response of a single organism or a population of organisms to contaminants. The activation of certain enzymes in the reactions of biotransformation and detoxification of contaminants has been demonstrated in different organisms (e.g., animals and aquatic plants), and its application as a tool to assess the quality of water and soil has been recently proposed. Biomarker studies give an integrated view of how organisms are affected by the bioavailable fraction of the contaminants present in the environment. These biomarkers are considered to be early warning signals that can be used in assessing the environmental risk of contamination (Gastaldi et al., 2007). The determination of metallothioneins is used to assess metal contamination. Metallothioneins are low molecular weight proteins that are mainly involved in the detoxification of metals (De Ocampo and Ocampo, 1999). An increasing content of metallothioneins has been considered to be a specific biomarker of metal exposure. Metallothioneins are also involved in various cellular functions, such as the regulation of growth and antioxidant defences (Mosleh et al., 2007). Oxidative stress is the imbalance between the production of free radicals and antioxidant defence systems, either because of a defence deficit or an increase in the production of oxygen reactive species. This stress results in changes in the structure-function relationship in some organs, systems, or specialised cells group (Lasczyca et al., 2004, Leon et al., 2004). Several antioxidant systems have been studied in fish, bivalves and oligochaetes experimentally exposed to chemicals or collected from contaminated areas (Martín-Díaz et al., 2008). The parameters studied include antioxidant enzymes that might be useful as biomarkers and reflect not only exposure to pollutants but also their toxicity. Catalase is one of the enzymes involved in cellular antioxidant defence systems against radicals. Catalase is a peroxisomal hydroperoxidase that converts hydrogen peroxide to oxygen and water (Mosleh et al., 2007). Glutathione S-transferase (GST) is a well-known phase II enzyme that catalyses detoxification conjugation reactions to facilitate the excretion of chemicals (Martín-Díaz et al., 2008; LaCourse et al., 2009). Also, it has been shown that GST is involved in antioxidant defences (Contardo-Jara and Wiegand, 2008). The Aconcagua river basin in central Chile is one of the most important agricultural areas in the country. However, several copper mining industries are located in these areas of the basin. High concentrations of copper are found in this area compared with similar areas without copper mining activity. There is little information available about copper's toxicity to organisms and crops in the agricultural soils of Chile (Avila et al., 2009). The toxicity of these soils has been assessed through oxidative stress biomarkers (Gaete et al., 2010), but only catalase activity and lipid peroxidation were determined. Therefore, the objective of this study was to assess toxicity and its relation to high concentrations of copper using molecular biomarkers to evaluate glutathiones transferase activity, metallothionein concentration, lipid peroxidation level and catalase activity in Eisenia foetida exposed to agricultural soils located close to copper mining activities in the Aconcagua river basin. Samples were taken from agricultural soils in different locations within the Region of Valparaiso (central Chile). The sampling points were established in areas close to mining activity and areas not influenced by mining activities (Table 1). Soil samples were taken between 0 and 20 cm depths, removing the existing vegetation. The total copper concentration was determined by atomic absorption spectrophotometry after acid digestion of soil with a mixture of hydrofluoric acid and perchloric acid. The soil texture was determined using a simplified hydrometer method. The concentration of organic matter (OM) was obtained by the wet combustion method and colorimetric determination of reduced chromate according to Sadzawka et al. (2006). The electrical conductivity and pH in saturated paste extract was determined (Sadzawka et al., 2006). In the same extract, the concentration of soluble Cu was determined by atomic absorption spectrometry, and the activity of the free copper ion Cu+2 (pcu+2) was determined using a copper ion selective electrode (Rachou et al., 2007). Rachou et al. (2007) validated the determination of Cu speciation with and without weak and/or strong ligands. The results obtained using the Cu ion-selective electrode were compared with those predicted in the presence of different organic ligands or even the lower free Cu+2 activities resulting from the formation of Cu hydroxyl species. The method was validated for the determination of Cu speciation in environmentally relevant free Cu+2 activity, i.e., ranging between 10-14 and 10-4 M. The results agree with pH values between 3 and 10. The tests were conducted with the earthworm E. foetida according to the methodology standardised by the Organization for Economic Cooperation and Development (2000). Adult E. foetida worms (with visible clitellum) were washed with distilled water before the bioassay, dried on filter paper, and weighed individually. The containers for the bioassays were plastic with a 750 mL capacity, and each one was filled with 500 g of soil. Forty-five earthworms were placed in each soil sample, which was divided into three replicates. The organisms were fed with cow dung (from animals in contamination-free areas) soaked with 5 mL of distilled water. To accustom the worms to the food, they were fed on it for a week before the bioassay. The temperature during the bioassay was maintained within the range of 22-24° C, with an illumination of 400 lux and a photoperiod of 12 hours of light and 12 hours of darkness. The humidity was maintained through the application of 40 mL of distilled water once a week. 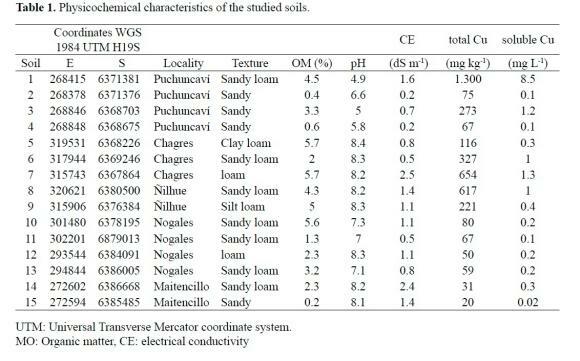 At the end of the 28 days of exposure to the soil, the molecular parameters described in the following paragraphs were determined. One gram of worm tissue was extracted for each replicate of the soil samples. Then, the gut was emptied for 24 h (depuration phase). For the determination of catalase activity, thiobarbituric acid reactive species (TBARS) level, and total protein content, the earthworms were placed in liquid nitrogen and later crushed in a mortar with 3 mL of phosphate buffered saline (PBS, pH 7.4). For the metallothionein determination, 2 mL of homogenisation buffer at pH 8.6 was used. The homogenised samples were centrifuged at 4000 rpm for 10 minutes. The enzymatic activity of the catalase and the total protein were determined in the supernatant. For lipid peroxidation determination, a sample was used directly without centrifugation. The catalase activity was determined according to Claiborne (1985). This method is based on a determination of the kinetic of degradation of hydrogen peroxide. The kinetic was followed spectrophotometrically by a reading absorbance at 240 nm. The procedure involved mixing 2.9 mL of phosphate buffer at pH 7.0, 100 mL of H2O2 0.3 M and 20 mL of homogenised worm tissue. The catalase values were reported as units of enzyme/mg total protein. The total protein was determined according to Lowry (1951). Substances that react to thiobarbituric acid from lipid peroxidation were determined. The procedure consisted of reacting 1 mL of earthworm sample tissue once proteins were removed by precipitation with trichloroacetic acid (30%) and centrifuging for 10 minutes at 4000 rpm following the addition of thiobarbituric acid (0.67% w/v). The sample was heated in a boiling water bath for 20 minutes. The sample was then kept on ice, and the absorbance of the reaction product at 540 nm was read. Metallothionein determination was based on the method described by Linde et al. (2008). The tissue obtained from each experimental specimen was placed in 3 volumes of the homogenisation buffer (0.5 M sucrose, 20 mM Tris-HCl buffer, pH 8.6, containing 0.01% β-mercaptoethanol) in plastic tubes. The tissues were homogenised using a tissue homogeniser. The homogenate was distributed in aliquots (3 mL). The homogenates were centrifuged at 30,000 x g for 20 min to obtain a supernatant containing metallothionein. Then, 1.05 mL of cold (-20 °C) absolute eth-anol and 80 μL of chloroform was added per 1 ml of resulting supernatant. The samples were centrifuged in the cold (at 0-4 °C) at 6000 x g for 10 min. Three volumes of cold ethanol were added to the resulting supernatant and stored at -20 °C for 1 h.
For the purification and quantification of metallothionein, the supernatant was centrifuged at 6000 x g for 10 min. The resulting pellets were washed with an ethanol:chloroform:homogenisation buffer (87:1:12 and then centrifuged again at 6000 x g for 10 min. The pellets were then dried under a nitrogen gas stream to complete the evaporation. The dried pellets were resuspended in 300 μL of 5 mM Tris-HCl, 1 mM EDTA, at pH 7. The pellets were then added to the resuspended metallothionein fraction to 4.2 ml of 0.43 mM 5,5 -dithiobis(nitrobenzoic acid) in a 0.2 M phosphate buffer at pH 8; it was then left for 30 min at room temperature. Then, the concentration of reduced sulfhydryl was evaluated by reading the absorbance at 412 nm in a spectrophotometer. A standard curve with GSH was required as a standard reference for a correct quantification of MT in the samples. GSH contains one cysteine per molecule; thus, it can be used as a standard for quantifying cysteins in protein analyses. Solutions with different concentrations of GSH were prepared, and their absorbance was measured at 412 nm. The amount of metallothionein in the samples was estimated using the GSH standard, assuming that 1 mol of MT contains 20 mol of cystein (Linde et al., 2008). The activity of glutathione-S-transferase (GST) was measured through the increase in absorbance at 340 nm due to the conjugation of glutathione (GSH) to 1-chloro-2,4-dinitrobenzene (CDNB) according to the modified methodology of Regoli et al. (1997). The procedure was to prepare fresh solutions of GSH (40 mM) in a sodium phosphate buffer (0.01 M, pH 7.6) and CDNB (40 mM) in 97% ethanol. The reaction mixture contained 100 uL of glutathione solution, 100 uL of CDNB and 0.5 mL of potassium phosphate buffer (0.1 M, pH 6.5) and was mixed and incubated for 5 minutes at 25 °C. The reaction was initiated by adding 30 uL of worm extract. The absorbance was measured at 340 nm for 4 minutes, and the activity was expressed as enzyme unit per mg of total protein. The interpretation of the results of the biological parameters obtained from the different soils was carried out by analysis of variance (ANOVA). When the ANOVA showed significant differences between treatments, an analysis of multiple comparisons (Tukey test) at 5% significance was conducted. In addition, regressions and correlations were performed between biological responses and different chemical forms of copper. The 7 and Systat 5.0 Statistics were used. The soils that were sampled had pH ranges between 4.9 and 8.4, and the organic matter content was between 0.2% to 5.7%. The range of total copper concentration in the soils was between 20 mg kg-1 and 1300 mg kg-1. With the exception of soil 15, all soils exceeded the global average concentration of total copper (30 mg kg-1). The total copper concentration in soil 1 was 65 times higher than that in soil 15. The range of soluble copper concentration was between 0.02 mg L-1 and 8.5 mg L-1. The soluble copper in soil 1 was 8 times higher than that in the soil 15. The % organic matter was lower in soil 15, at 0.2%, and was higher in soils 5 and 7, at 5.7% organic matter (Table 2a). 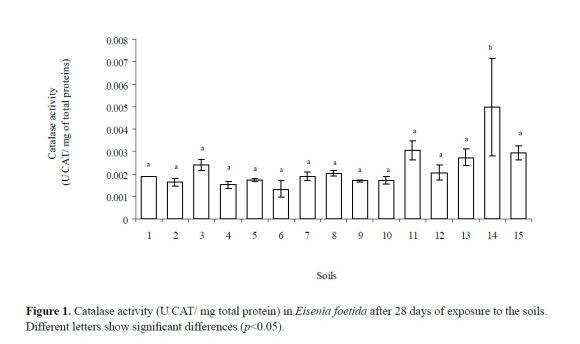 The catalase activity in E. foetida did not change significantly between soils except for an increase in soil 14 (Figure 1). In the determination of thiobarbituric acid reactive species, there was a significant variation among E. foetida from different soils, with the highest levels in soils 5, 10, 11, and 12 and the lowest levels in soils 1, 3, 6 and 9 (Figure 2). A significant negative correlation was observed with total and dissolved copper (Table 3). 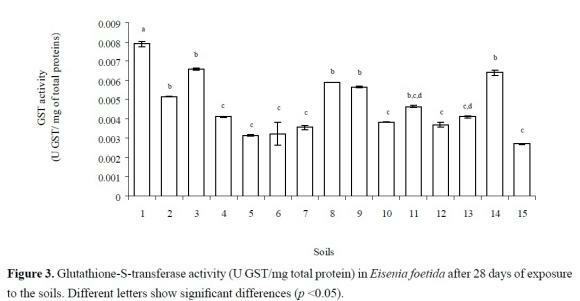 There was a significant change in E. foetida GST enzyme activity among the soils. Organisms from soil 15 exhibited the lowest activity of GST, while the highest activity was in samples 1, 3, 8, 9 and 14 (Figure 3). 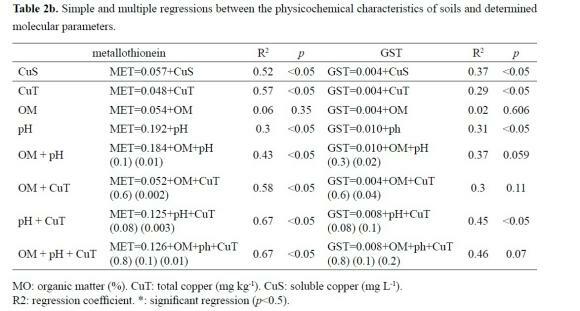 A significant positive correlation was observed with the concentrations of total and soluble copper (Table 3). The metallothionein concentrations in E. foetida varied significantly between soils. The lowest concentrations were in organisms from soils 5 to 15, while the highest were from soils 1, 3, 8, 9 and 14 (Figure 4). Significant correlations with total and soluble copper were observed (Table 3). 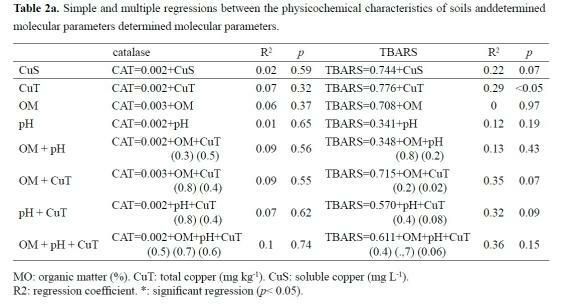 Both copper and pH, individually and in interaction, correlated with the activity of GST and the concentration of metallothionein, while the TBARS correlated only with total copper (Table 2a and Table 2b). Positive correlations between GST activity and metallothionein concentration with both forms (total and soluble) of copper were observed, while there was a negative correlation with pH. TBARS correlated negatively with both states of copper (Table 3). Oxidative damage was observed in the earthworm E. foetida due to exposure to the soils. The GST activity, TBARS level and metallothionein level in the organisms showed significant differences between the soils. The GST activity and metallothionein concentrations showed a non-significant increase after exposure to some soils in comparison with the soils with lower copper concentrations. Similar results were reported by Gaete et al. (2010), who found that the catalase activity, SOD (superoxide dismutase) activity and TBARS level in the same species varied following exposure to different soils; however, we did not include GST and metallothionein determinations. No significant differences were observed in cata-lase activity between soils, which could be attributed to possible enzyme damage due to the long exposure time. Arasu and Reddy (1995) found decreased activity in the marine bivalve Perna viridis. They attributed this decrease to enzyme damage due to the time of exposure and the decrease of copper excretion from tissues. However, the decrease in catalase activity could be related to the protective effect of organic matter, which would reduce the copper bioavailability and, therefore, its toxic effects. Gaete et al. (2010) found that high concentrations of copper reduce the activity of catalase, possibly by the action of hydroxyl radicals formed in Fenton reactions. Therefore, catalase activity varies when the oxidants are present in low concentrations. Soils 1, 3, and 6 have the highest copper concentrations; however, their organisms have the lowest oxidative damage determined through lipid peroxidation. This result can be explained by the increase of the activity of the GST enzyme and the concentration of metallothioneins. However, soils 2, 4, and 15 have the lowest copper concentrations, and these earthworms exhibited the highest level of lipid peroxidation. The earthworms in these soils exhibit a low GST activity and a low metallothionein concentration and are thus not protected against lipid peroxidation. In addition, the percentage of organic matter is low in these soils. In fact, organic matter plays a protective role in diminishing the bioavailability of metals in the soil. Copper produces lipid peroxidation, which in turn causes oxidative damage (Chaffai et al., 2005). Damage to cell membranes was observed in E. foetida, and a relationship between TBARS and total copper was found, resulting in the conversion of unsaturated fatty acids in small fragments of aldehydes such as MDA. The lipid peroxidation process can strongly affect the functionality of biological membranes, eventually causing cell death (Chaffai et al., 2005). The peroxidation of polyunsaturated fatty acids caused by transition metals such as iron and copper has been widely studied (Arasu and Reddy, 1995). Cuprous ions react with hydrogen peroxide at a rate much higher than ferrous ions to produce hydroxyl radicals through Fenton reactions. In this study, we found that the metallothionein concentrations were higher in the soils that had lower lipid peroxidation levels. This result is consistent with that reported by Ringwood et al. (1998), who evaluated the effect of lead on the levels of lipid peroxidation and metallothioneins in the oyster Crassostrea virginica. Arasu and Ramos (1995) highlighted the importance of metallothioneins and lipofuscin in copper elimination in the bivalve Perna viridis and that both compounds form insoluble complexes with metal that is easily removed from the cell by exocytosis. Metallothioneins participate in the defence against oxidative stress. These proteins have a large number of thiols in their structure. This chemical group can react with great affinity with electrophilic radicals such as ROS (Carrasco, 2000). In our study, the metallothionein concentrations in the earthworms were higher in all soils compared with those exposed to the lowest copper concentrations. Also, a positive correlation with copper in both forms (total and soluble) was observed. Soil 15 was the exception, with a significant decrease in copper concentration but with an increase in oxidative damage in the organisms. In earthworms from soils 1 and 3, the production of thiobarbituric acid reactive species (TBARS) decreased in relation to those from other soils, possibly due to the increased concentration of metallothioneins. This situation was observed in all soils, which exhibited an inverse relationship between the concentration of metallothioneins and lipid peroxidation. Therefore, metallothioneins could act as a compensatory mechanism to reduce the adverse effects of copper, such as lipid peroxidation (Arasu and Reddy, 1995). These proteins appear to play a role in the regulation of essential metals and in metal detoxification (Mosleh et al., 2007). The increase in metallothionein levels in this study agrees with the findings of Gaston et al. (2007), who conducted studies on E. andrei and found that low concentrations of essential metals, such as copper, and non-essential metals, such as cadmium, induced a significant increase in metallothionein content. Gillis et al. (2004) found a relationship between exposure to cadmium and metallothionein levels in T. tufifex. They reported that metallothionein levels are more sensitive to cadmium exposure that the response of population parameters (reproduction and growth), demonstrating that biomarkers are early warning signal responses. Gills et al. (2004) also showed how the increase in metallothionein concentration corresponds to a decrease in reproduction by relating the concentration of metallothionein to the fitness of the organism. The ability of metallothioneins to sequester ROS is reflected in the protective effect against such damage to the membranes. Glutathione S-transferase belongs to a family of enzymes that use glutathione (GSH) as a substrate in a reaction that allows for the biotransformation and deactivation or detoxification of a wide range of exogenous compounds (Martín-Díaz et al., 2008). In our study, increased GST activity in E. foetida was observed in soils with higher concentrations of copper. Mosleh (2007) found increased levels of GST activity in T. tubifex exposed to chitosan. Moreover, Martín-Díaz et al. (2008) found that GST activity in Carcinus maenas (Decapoda) and Ruditapes philippinarun (clams) was significantly induced by the presence of several metals (As, Cd, Cr, Cu, Fe, Hg, Mn, and Pb). The GST increase in response to several chemical agents, including inorganic (cadmium, copper), organic (fluoranthene) and chemical (atrazine) compounds, has been reported by LaCourse et al. (2009). In this study, we found that catalase and GST activities behaved differently: while the former decreased, the latter increased. Similar results have been reported by Contardo-Jara and Wiegand (2008) in the worm Lumbriculus variegates exposed to the herbicide paraquat. These authors reported that catalase activity decreased by 65% in all treatments, regardless of exposure time, while GST activity was significantly high, at 15%, when the exposure time was longer. Therefore, it can be assumed that the enzyme activity of GST increases after a period in which higher concentrations of contaminants accumulate in body tissues in E. foetida. The bioavailability of a metal depends on the physicochemical characteristics of the soils. These variables determine the degree of solubilisation of the metals or the buffering capacity of the soil. The most important of these variables are pH, organic matter content, and the amount and type of clays (Warren and Alloway, 2003; Gastaldi et al., 2007; Owojori et al., 2009). In this study, the pH values, individually and in interaction with copper in both forms (total and soluble), were correlated with molecular parameters. In conclusion, a correlation between pH and copper (total, soluble) with molecular parameters was observed. Metallothioneins and GST are proposed as early warning biomarkers of the toxic effects of chemicals in soils.